NordVPN lets you browse incognito around the world. For years, net neutrality was something many of us took for granted. Then, last December, the FCC voted to repeal a host of Obama-era protections against data throttling and blocking by ISPs, sparking a massive debate over the issue. Now, a lawsuit has been filed over the FCC’s appeal, and most recently, the Internet Association, which represents Internet heavy hitters like Google, Facebook, and Amazon, has filed to intervene in the suit. With net neutrality in jeopardy, there’s no question that you should be doing everything you can to keep your browsing private and secure. To this end, one of the best things you can do is arm yourself with a VPN, or virtual private network. But, with new VPN options constantly flooding the market, it can be difficult to determine which ones are worth your time and which are little more than digital snake oil. If you’ve done any searching, you’ve likely come across NordVPN and its host of industry accolades. Praised for its colossal server network and device flexibility, this solution has been rated 5 out of 5 stars by TrustPilot and CNET and even nabbed the rare “outstanding” rating from PC Mag. Two-year plans normally retail for a costly $286, but tech deal site StackSocial is selling subscriptions for only $69, saving you a whopping 75 percent off the usual price, and making it well worth the purchase. For the uninitiated, VPNs keep your data secure by routing your information through a private tunnel that’s hidden from the eyes of your ISP, the government, and any pesky snoopers. A VPN’s encryption capabilities are what keeps this tunnel private. So if a VPN isn’t touting the best encryption methods out there, it’s really not doing you much good. Nord VPN offers extra protection by utilizing double data SSL-based 2048-bit encryption to route your data through its tunnels, keeping your browsing movements and information anonymous. Even if a VPN is toting bulletproof security, it does you no good if you can’t connect to its servers. 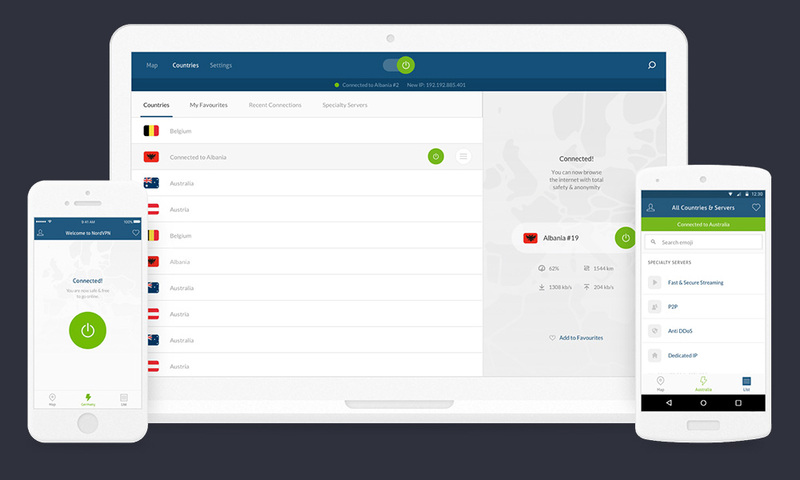 NordVPN delivers online access virtually anywhere with more than 3,500 worldwide server locations in over 60 different countries. Plus, if you find yourself frequently venturing abroad, you’ll be pleased to know that NordVPN lets you navigate past those pesky geo-restrictions that prevent you from streaming content like Netflix and Hulu in certain countries. If you consider yourself a self-respecting techie, you likely surf the Web on more than one device. NordVPN gets this, which is why it lets you connect up to six devices to its service simultaneously, allowing you to browse on your laptop, smartphone, tablet, and three other devices without missing a beat. And, NordVPN’s improved Android app lets you navigate through the interface on the move with minimal hassle. One of the biggest complaints with VPNs is that they tend to tank your browsing speed while masking your online movements, making it a struggle to stream shows, download files, and so on. This service lets you use unlimited data and access high-speed connections for streaming video and content access. That way, you can get the most out of your browsing while keeping your digital bases covered. You shouldn’t take any chances when it comes to your online security, and with StackSocial’s deal, you’ll be arming yourself with some of the best protection out there for a fraction of the cost. StackSocial is one of the premier sites for purchasing VPNs and boasts hundreds of articles across the Web mentioning their deals. Now, you can sign up for a two-year subscription to NordVPN for $69, saving 75 percent off the normal retail price.